Here is a super quick video on how to make this. For more videos, you can subscribe to my You Tube Channel. A super easy and inexpensive meal! In a large saute pan , on medium heat, saute the sweet potatoes, onion, garlic and sage in olive oil. Cover and let cook until the sweet potato and onions start to soften. Make sure you stir occasionally as well. 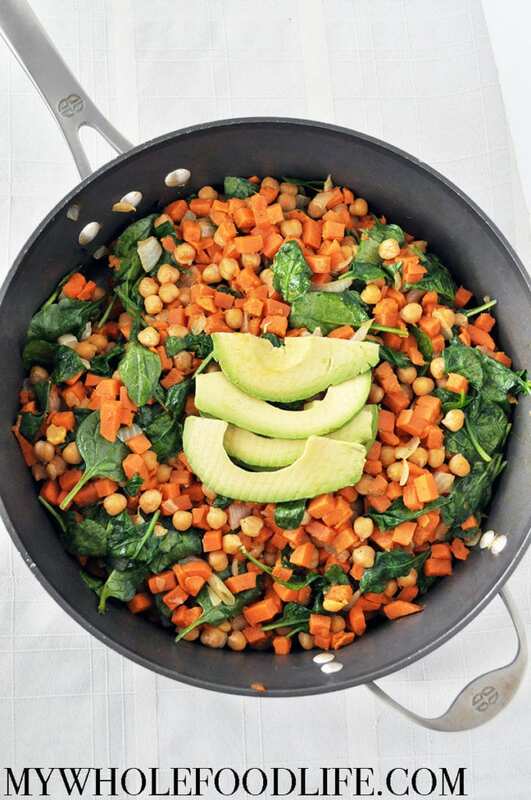 Once the sweet potatoes start to soften, add the chickpeas and cook for a few more minutes. Lastly, add the spinach and salt to taste. Cook until the spinach is slightly wilted. This should keep for at least 4 days in the fridge. You can also freeze it for longer storage. Enjoy! This looks like a great recipe, thank you! I am curious, what containers do you use to freeze most of your meals? Do you just put them in a small container (like Tupperware) and do you need to do anything special to them to prevent freezer burn? Only thing I'd have to say is that this was too dry. Maybe I cooked it for too long? Otherwise this dish was delicious, thank you for sharing! I don't have any sage in the house, will something like thyme work, or any spices you'd recommend in it's place? That might work in it's place. I love the color of this dish! And it looks so super pretty with the sweet potato cubed into tiny pieces like that! How many calories per serving and how many cups is a serving?